I came here because noone could give me an answer for my question. When i was installing Gothic today i wasn't expecting problems coming out with it. So, when i ended playing and exited out of Gothic closing it, i reported a window with somekind of error! When i pressed OK nothing happend and the window has been closed. But, when i pressed Anuluj (eng. Cancel) another error window came out! I dont know what it is! Once, when i had installed Gothic (yr. ago) there wasn't errors like that [on the same hardware]. Today i use WinXP SP2. I have newest drivers too. I hope you know what is wrong and can help me! Ok, so there came only these error messages u can play it normal? I found a similar topic in the German forum. Statement of the developers "it is normal". 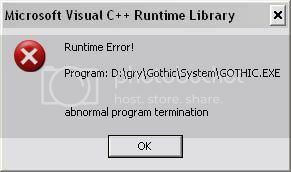 ^^ With the newest version of the gothic starter the error messages will be automatically closed - it is a solution isn't it? First, hi and §welcome to the forum, feel free to post something in the Welcome-Thread about yourself! That is a known bug, but not a problem at all. Guys, I don't know what happend, but the problem I was saying about is gone. Just like that. And the funniest thing is I don't know how. When I want to close Gothic, I press Exit and etc. and it should be closed, but its minimalizing and music keep playing. Press Alt+Ctrl+Delete click on gothic application and end task. You know, it should never happen like that. The game should get closed without any trix, hax etc. Sorry for this, but I'm really confused. I just don't know what is really going on with this game! Its first time when i meet problems with it. Guys, would you like to give me dicrect instructions how to install that patch you gave me links at your posts? Just extract the file into Gothic folder. Then see if problems persists. NOTE: if you have instaled Gothic Starter before, when you extract the file in gothic folder you will be asked if you want to replace the GothicStarter file. Click yes to All. Stop crying anymore for god sake throw a computer in fire and the problem is solved. Or, reinstall all without gothicstarter^^? -How many programs do you have running in the background during sync? -Are you moving lots of desktop applications in and out of memory (opening and closing) while the sync occurs? Smartheap errors occur when your PC is low on memory. Even if you have 1024 megs of desktop memory, this often occurs if you are opening multiple applications, or closing them during Hotsync. Try to restart the PC and after that open gothic. PS : If you have alot of programs in your startup then it might not help. PPS : If that is not your problem then i would suggest on contacting them. It seems that the cause might be SP2. If you don't have that installed then don't bother to open the link. *click*. PPS : This is not Gothic's fault. Don't blame the game. It's just one of the many "good" things from Windows and our dear Microsoft. Last edited by rockfest; 21.11.2005 at 01:19. Omg Omg! You solved it! Thanks for that link! Once I installed supporting of korean, japan etc. languages, and then i just had to uninstall it! I can play Gothic without any background problems from now. Once again, thx for ur hax! Last edited by rockfest; 21.11.2005 at 17:34.
i have problem, i have windows vista home premium 32 and when i instlal and start gothic 1 or 2 it do nothing...proces start but it do nothing and it write MEM_BAD_POINTER....somebody know how to fix it? did you even try anything in this thread? Ach Fry, Ich hab dich mehr als der Monde, die Sterne...das...fail. Hi all, first post here. I'm sorry about the thread necromancy as well. I'm having this same issue on a machine with 2GB ram. I've updated it, and I'm using Gothic starter and I can't for the life of me get it to run, and I have no idea why. I'm on Windows Vista though, which I suspect has something to do with it.